I heard so many comments from friends family - "Why! ", "You're crazy", "OMG OMG". 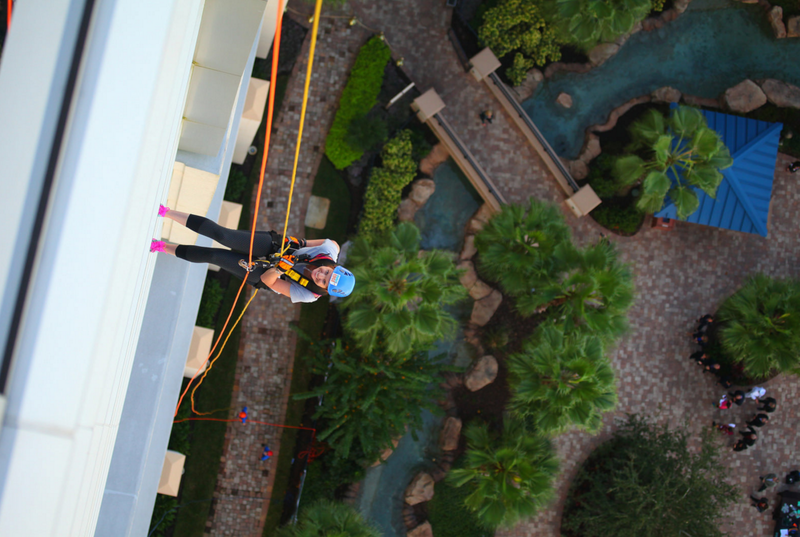 So why am I hanging off of the Hyatt Regency Orlando, 28 stories in the air? 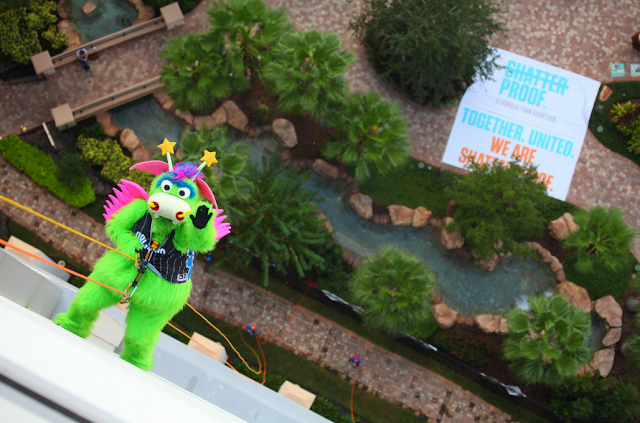 The answer: Shatterproof Challenge Rappelling Series. Every four minutes someone dies from addiction to alcohol or other drugs. According to the National Survey on Drug Use and Health (NSDUH), an estimated 20 million Americans age 12 or older use illegal drugs each month. In the U.S. alone, over 135,000 people die from alcohol or other drugs every year. Shatterproof is a national organization committed to protecting our loved ones from addiction to illicit and prescription drugs, and alcohol. The Shatterproof Challenge Rappelling Series is a nationwide event to draw attention to the national epidemic of drug and alcohol addiction. We rappelled as a part of a national movement to honor our loved ones in recovery and remember those we have lost. In 2012, Gary Mendell, a member of the Clinton Health Matters Initiative, founded Shatterproof to educate, empower and equip families, educators, health care providers, legislators and others to proactively address addiction among children and young adults. Mendell and his team are building a national organization to bridge serious gaps in funding and resources for the disease of addiction. His son, Brian Mendell, lost his battle with addiction at the age of 25 in 2011. While my blog may be called I Run For Wine, addiction is something that hits way too close to home and when I heard of Gary's organization, I wanted to help share the word. I have had too many loved ones affected by addiction. I was born and raised in Daytona Beach, FL and we have lost more classmates to drugs and alcohol. It has become a stigma of "Daytona Happened" when we hear of the loss of another friend. This is not ok.
Today I rappelled for three people. I want to share their stories, a few of the names I changed for their privacy. *Billy was my first love. We dated in high school and had an on again off again relationship. We were your typical teenagers in love. When I turned 18, I got access to my trust fund from an accident I had as a child. Billy and I got an apartment together and things quickly turned awful. He would disappear for nights at a time on "fishing trips" with friends. This was in the 90's, pre check-card days so I lived off of cash. Instead of going to the bank, I had cash stashed under my mattress. Smart right? One day while doing laundry, I noticed phone number after phone number in Billy's pockets. He was cheating on me. I called one of the girls and she told me that he was her drug dealer. WHAT. I instantly went to my stash and found out that Billy stole a great deal of my money to buy drugs. We split up after many years together and he became very addicted to multiple drugs. He moved out of the state and spent a great deal of his life in prison for drug trafficking. A year before he got out of prison, he wrote me a hand written card, apologizing for everything. He is out of prison now and his life is back on track. He recently got re-baptized and is working two jobs. I hear reports on him that he is doing well. I pray nightly that he continues to fight and be strong. *Aubrey and I met in 11th grade. We instantly became inseparable and always referred to each other as sole sisters and we called each other Boo. We had a lot of fun together over the years and she was always my most adventurous friend. While I knew she liked to smoke marijuana on a frequent basis, I had no idea of the true demons going on inside of her. In 2005, I went on a two week trip to the Islands and she watched my Cat. Upon returning home, Aubrey was acting strange and it took a few months for me to realize what was going on. She stole my check book while I was away and was writing checks which equaled to thousands of dollars to support her addiction to pills. I did not report her to the authorities as it was grand theft and I didn't want to lose a friend. All who knew her were in denial of her problems. We thought this was something she would shake and would go back to normal. Eventually her addiction to pills turned into something far worse. From that point, she has been in prison and jail countless times. I tried to support her, only to be lied to and be heartbroken all over when she relapsed time and time again. She bounced from halfway house to halfway house and never got the real treatment she needed to fight her addiction. Today, I have no idea what she is up to but do know she was recently arrested again. I always wonder, if I reported her for grand theft when all this began, would she be where she is today? Will she ever get the help she truly needs? Will I ever get my "Boo" back? Jason is the brother of my guy best friend. While Jason and I were never close, I've known him a very long time. A father of four and a well known Occupational Therapist, Jay had demons that only his friends and family knew about. He had a serious problem with alcohol and would be the first to admit it. He knew he had a problem but refused to seek treatment. Three weeks ago today, I received the phone call that shook my world. Jason took his own life by shooting himself. My heart shattered for his four kids and family. This was a situation where you just wish you could get a time machine and make someone seek the help they knew they needed. 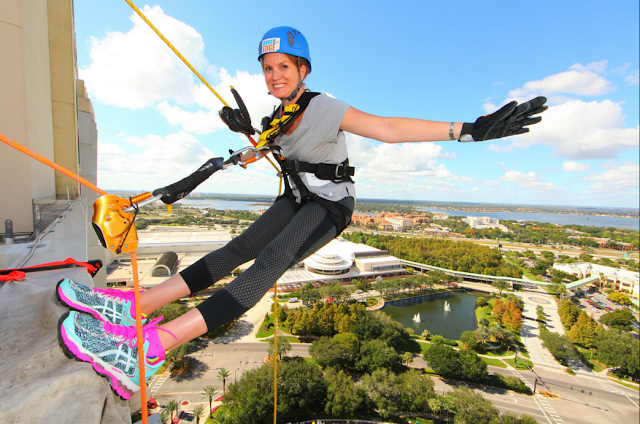 I was one of 55 individuals who rappelled down the Hyatt Regency Orlando, the city’s second-tallest building. There was a mix of media, local celebrities, recovering addicts and those who lost loved ones to the disease. The day helped raise vital funds for the prevention, treatment and recovery of this disease and to end the unjust stigma.